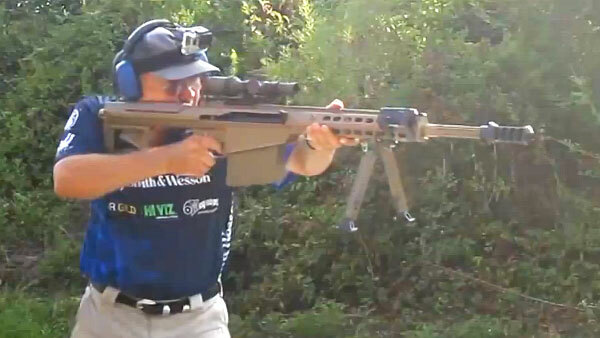 Miculek Shoots Six .50 BMG Rounds, Offhand, in Under 1 Second! Legendary shooter Jerry Miculek holds multiple world records, and has amassed over 80 major championship titles. He is considered “one of the fastest trigger fingers” on the planet. In this video, Jerry puts his skills to the test, using a Barrett m82A1 .50 BMG in a timed speed run. Watch the video, starting at the 1:20 mark, to see this amazing speed run. Jerry shoots six (6) .50 BMG rounds in under one second (0.98 to be precise). And Jerry did that standing (offhand) without a rest. What can you say… the man is a beast. If you look carefully, in this frame you can see a .50-Cal bullet in flight forward of the muzzle brake. Share the post "Miculek Shoots Six .50 BMG Rounds, Offhand, in Under 1 Second!" Look how much gas pressure is at the opening bolt!